UPDATED: Mon., Jan. 22, 2018, 10:41 p.m.
Desmond Bane scored eight of his 15 points in just over a minute early in the second half, and TCU beat No. 7 West Virginia 82-73 on Monday night in Fort Worth, Texas. The Horned Frogs (15-5, 3-5 Big 12) got their first home win over a Top 10 team in nearly five years on the same day they dropped out of the AP Top 25 to end an eight-week run as a ranked team. Jevon Carter had 16 points and Sagaba Konate 14 for West Virginia (16-4, 5-3), as all five starters scored in double figures while losing for the third time in four games. Daxter Miles Jr. had 12 points, Lamont West 11 and Wesley Harris 10. 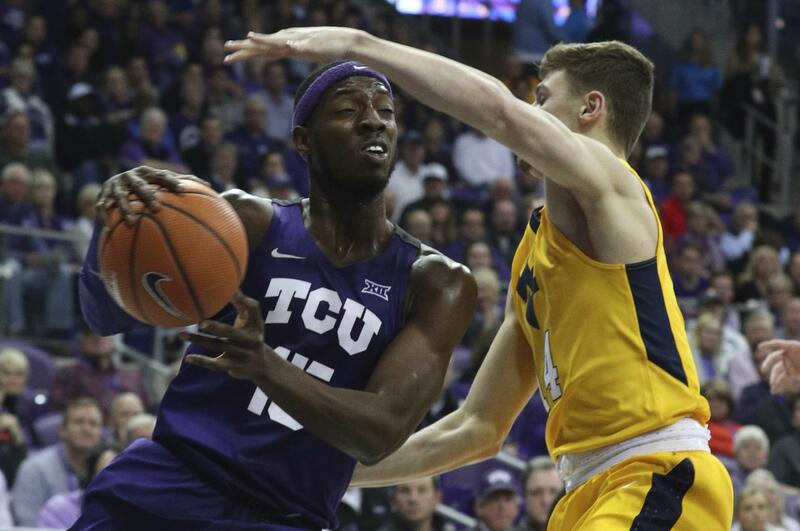 Alex Robinson had 17 points, nine assists and seven rebounds for TCU, and Kouat Noi had 13 points with three 3-pointers before being ejected because of a flagrant foul with just over 10 minutes left. Vladimir Brodziansky had 14 points, and Kenrich Williams had 14 rebounds. (6) Michigan State 87, Illinois 74: Miles Bridges scored 31 points, Jaren Jackson Jr. had 21 points and 11 rebounds and the Spartans (18-3, 6-2 Big Ten) got a harder-than-expected win over the Illini (10-11, 0-8) in Champaign, Illinois. Michigan State shot 68.2 percent, which set a record at State Farm Center for an opponent’s shooting percentage. Illinois shot 43.1 percent. Kipper Nichols led Illinois with a career-high 27 points. Trent Frazier and Leron Black added 13 and 12, respectively. Michigan State turned the ball over 25 times. It was the third straight game in which the Spartans gave it away more than 20 times and still won by double digits. Virginia Tech 80, (10) North Carolina 69: Justin Robinson scored 19 points and the Hokies (14-6, 3-4 Atlantic Coast Conference) pulled away in the second half to beat the Tar Heels (16-5, 5-3) in Blacksburg, Virginia. Ahmed Hill added 18 points for Virginia Tech. Hill scored seven in a row to start the decisive 13-3 burst, which turned a 51-48 lead into a 64-51 advantage with just under eight minutes remaining. Kerry Blackshear Jr. added 16 points. Joel Berry and Luke Maye scored 23 points each for the Tar Heels. North Carolina never got closer than eight points in the final eight minutes. The Hokies ended the first half on a 15-2 run to lead 39-32 at the break. Back-to-back 3-pointers by Berry sparked the Tar Heels early in the second half, but then Hill’s 3-pointer started his personal 7-0 run. (13) Ohio State 64, Nebraska 59: Keita Bates-Diop scored 14 of his 20 points in the second half and the Buckeyes (18-4, 9-0 Big Ten) beat the Corhuskers (14-8, 5-4) in Columbus, Ohio, the fourth victory for Ohio State in the last eight days. The back-and-forth game had seven lead changes in the second half. A pair of foul shots by Nebraska’s James Palmer Jr. cut Ohio State’s lead to four with 2:19 remaining, but the Cornhuskers couldn’t pull any closer. Jae’Sean Tate put the Buckeyes up by six with a layup with 1:02 left, and a pair of foul shots by Kaleb Wesson stretched it to eight. Palmer hit a 3-pointer with 12 seconds left, but Nebraska ran out of time. Palmer had a career-high 34 points. Nebraska was fresh off a 20-point upset of then-No. 23 Michigan on Thursday. Ohio State surpassed its win total for all of last season. Earlier in the day, it moved from No. 22 to No. 13 in the AP Top 25, its highest position since 2014. Published: Jan. 22, 2018, 10:32 p.m. Updated: Jan. 22, 2018, 10:41 p.m.